I have never made lap yuk before. I made this batch of lap yuk together with the lap cheong. It's very easy just marinate and hang to dry, that's it. I am not that crazy with lap yuk like I am with lap cheong, but it is nice to know how to make this. Cut the belly into long strip about 3 - 4 cm thick. Mix the marinade together then mix with the pork. Put pork and marinade in plastic ziploc bag and leave in the fridge for 3 - 4 days. Turn the bag once or twice a day to ensure the meat is evenly marinated. Take the pork out and make a hole using a skewer about 1" from the end then push a small piece of string through. Tie the string into a loop. 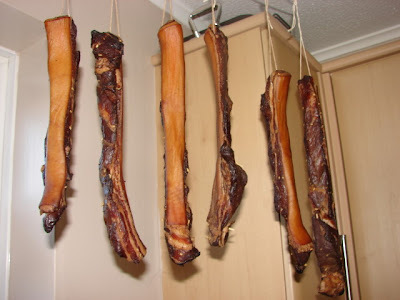 Hang the meat on a pole or wire clothe hanger, leave enough room between each piece for good air flow. Leave to dry somewhere airy. I just leave mine to hang in the kitchen near a open window. The meat will get drier and drier. About a week it will be ready. Keep the dried bacon in the fridge or freezer. I am not sure how long it will keep in the fridge before it will go off or turn rancid, so if you want to keep it for longer 2 - 3 few weeks, I'd strongly suggest leaving it in the freezer. 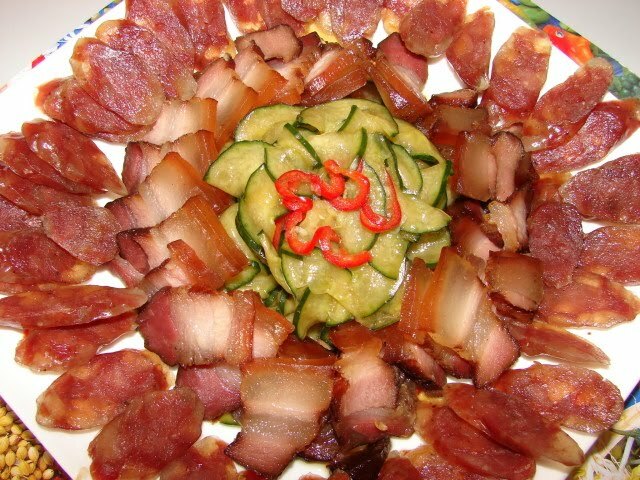 Cool, would try to make these as one of the dish for Chinese New Year next year! I'm loving your curing adventures, really interesting to read about and the results look great. I had shy away for too long. Really not that scary and easy to make esp. the lap yuk. Hope you will give it a go with gluten free soy for the gf's mom. I hope to cure some duck legs Chinese style too. I made some lak yuk and blogged about it here. http://saladdaysoffalnights.blogspot.co.uk/2012/05/lap-yuk-chinese-air-dried-bacon.html. Delicious. I want to try doing duck legs in this style also if you have any tips? You can use the same cure mixture for duck, I like a sweeter cure for duck you can use my lap cheong cure mix. Best to remove the bones and butterfly the leg before curing. Chinese also have a salty cured duck with bones, you can use legs/ butterflied whole duck . Make a dry cure mix with plenty of coarse salt, some cracked peppercorns and some Sichuan peppercorns. There is no need for prague powder because of the high concentration of salt, but if you like the meat looks pinky you can add some prague powder. Generously cover the duck leg or whole duck with this salt mixture, leave in the fridge for few days, then shake off the mix and air dry for a week. 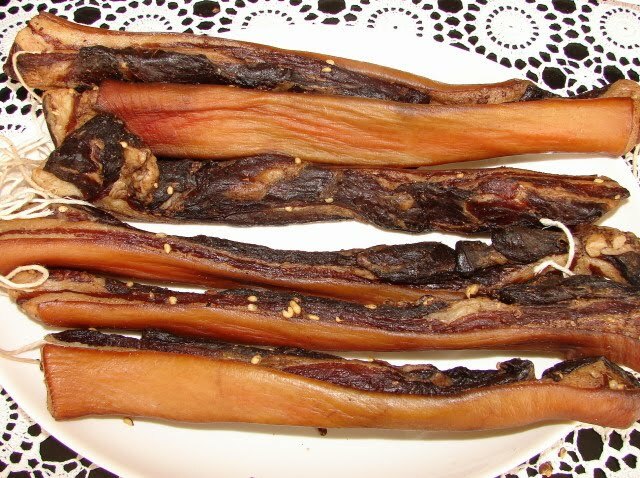 The resulting cured duck is very salty, normally needs soaking before steaming or cooking. Or we like to use it unsoaked, boil with rice to make rice soup. Is it possible to dry this in the dehydrator?